The Islamic State of Iraq and the Levant - Libya Province is a branch of the militant Islamist group Islamic State of Iraq and the Levant (ISIL), active in Libya. The branch was formed on 13 November 2014, following pledges of allegiance to ISIL leader Abu Bakr al-Baghdadi by militants in Libya. Al-Baghdadi announced the creation of three branches in Libya: Cyrenaica in the east, Fezzan in the desert south, and Tripolitania (or Tarabulus) in the west. In September 2014, an ISIL delegation that had been dispatched by the group's leadership arrived in Libya. The representatives included Abu Nabil al Anbari, a senior aide to al-Baghdadi and a veteran of the Iraq conflict, the Saudi Abu Habib al-Jazrawi, and the Yemeni or Saudi Abu al-Baraa el-Azdi, a militant and preacher from Syria. On 5 October 2014, the Islamic Youth Shura Council-aligned militant factions came together and pledged allegiance to ISIL. After the pledging ceremony, more than 60 pickup trucks filled with fighters cruised through the city in a victory parade. A second more formal gathering involving a larger array of factions took place on 30 October 2014, where the militants gathered to pledge allegiance to Abu Bakr al-Baghdadi in the city square. On 13 November 2014, al-Baghdadi released an audio-recording in which he accepted pledges of allegiance from supporters in five countries, including Libya, and announced the expansion of his group to those territories. He went on to announce the creation of three "provinces" (wilayat) in Libya, Cyrenaica in the east, Fezzan in the south, and Tripolitania in the west. The three wilayats in Libya represent statelets, meaning they are a governates that hold territory and operate like a state. ISIL claims a presence in al Bayda, Benghazi, Sirte, al-Khums, and the Libyan capital Tripoli. The Cyrenaica branch of ISIL has around 800 fighters and has half a dozen camps in Derna's outskirts. It also has larger facilities in the Jebel Akhdar area, where North African fighters are trained. In December 2014, ISIL recruiters in Turkey told their Libyan associates to stop sending fighters to Syria and to focus on domestic attacks, according to the Wall Street Journal. In the following weeks, ISIL carried out attacks against oil installations and international hotels, performed mass executions and attempted to take over further Libyan territory. The group made tactical alliances with al Qaeda-linked groups that did not formally pledge allegiance to it, such as the Benghazi branch of Ansar al-Sharia, members of Tunisia's Ansar al-Sharia, and al-Qaeda in the Islamic Maghreb's Tarek Ibn Ziyad Brigade. On 30 March 2015, Ansar al-Sharia's general Sharia jurist Abu Abdullah Al-Libi pledged allegiance to ISIL, a number of the group's members defected with him. The city of Sirte had been loyal to Muammar Gaddafi and suffered massive damage at the conclusion of the 2011 Civil War, later becoming home to militant Islamist groups like Ansar al-Sharia. ISIL formally announced their presence in Sirte in early 2015, driving a parade of vehicles through the city and declaring it part of their caliphate. Ansar al-Sharia split up in a dispute over how to respond, with most of their members joining ISIL. The group reportedly recruited many locals, former Gaddafi supporters alienated from the post-war political order in Libya, after they "repented" and pledged allegiance to al-Baghdadi. They were quickly able to take over much of the city. ISIL implemented their harsh interpretation of Sharia gradually, first focusing on building loyalty and allegiance from the tribal society of Sirte. In August 2015 Islamic codes of dress and behaviour began to be enforced more strongly and punishments like crucifixions and lashings began to be carried out. There was an uprising against ISIL in Sirte in the same month, with members of the Ferjani tribe, Salafists and former members of the security forces attacking ISIL forces. ISIL brought in reinforcements from outside of Sirte and the uprising was swiftly defeated, with media reports claiming dozens or hundreds of Sirte residents were killed after the fighting. ISIL began to solidify its rule in Sirte, increasing its state building efforts and using it as a base to expand its territory. ISIL fighters from Sirte took over the neighbouring towns of Nofaliya, and Harawa during this period. They also seized control of Ghardabiya Air Base and important infrastructure like power plants and part of the Great Man-Made River water irrigation project. In January 2016, it was reported that a sniper had killed several ISIL commanders in the Libyan city of Sirte. It is unclear whether the killings are the work of one man or many, or even simply an urban legend. The killings are said to have sowed panic among ISIL's forces in the city, who carried out arrests and executions in a bid to track down the culprit. By early 2016, there were an estimated 1,500, mostly foreign, fighters in the city, and Vice Admiral Clive Johnstone, commander of NATO's Allied Maritime Command, warned that ISIL militants aspired to build a maritime arm that could carry out attacks in the Mediterranean Sea against tourist and transfer ships. The group suffered reverses in other parts of Libya during this period, including in Derna, Benghazi, and Sabratha. In June 2015, clashes erupted in Derna between ISIL and the rival Shura Council of Mujahideen in Derna supported by the Libyan Air Force, which caused heavy casualties on both sides and led to ISIL forces being driven out of their strongholds in the city the following month. In November 2015, a US air strike killed ISIL's leader in Libya, Abu Nabil al Anbari. He was succeeded by Abdel Qader al-Najdi. In early 2016, it was reported that the Libyan National Army led by Khalifa Haftar had assistance of French Special Forces, and were able to capture parts of Benghazi that had been held by ISIL for months. However, these reports have yet to be confirmed. In February 2016, a U.S. air strike targeted an ISIL training camp near Sabratha, killing more than 40 people including the Tunisian ISIL member Noureddine Chouchane, linked to the 2015 Sousse attacks, as well as two Serbians who had been kidnapped by ISIL in 2015. Libyan intelligence chiefs claimed in early February 2016, that the Islamic State is recruiting fighters from Africa's poorest nations, including Chad, Mali and Sudan. ISIL offers generous salaries compared to the average wages in the region. Many of the fighters reach Libya using existing people-smuggling routes used by African migrants heading to Europe. The "Media Office for Cyrenaica Province" has published photos and other material showing buildings with ISIL insignia, suicide bombers, parades, and pledges of allegiance to Abu Bakr al-Baghdadi. A reporter for The New York Times who visited the outskirts of Sirte found that ISIL had taken over the local radio station, and all four stations on the dial were being used to transmit Islamic sermons. Billboards instructing women how to dress according to ISIL's interpretation of Sharia were erected in Sirte in July 2015. The billboard gave a list of restrictions on dress for women. It must not be perfumed." By late 2014, Derna was fully under ISIL control, with the Black Standard flying over government buildings, police cars carrying ISIL insignia, and the local football stadium being used for public executions. A Human Rights Watch report accused ISIL linked groups in control of Derna of war crimes and human rights abuses that include terrorizing residents in the absence of state authorities and the rule of law. Human Rights Watch documented 3 apparent summary executions and at least 10 public floggings by the Islamic Youth Shura Council, which joined ISIL in November 2014. They also documented beheadings of three Derna residents and 250 seemingly politically motivated assassinations of judges, public officials, members of the security forces, journalists, and others with no public investigations. Sarah Leah Whitson, HRW Middle East, and North Africa director said, "Commanders should understand that they may face domestic or international prosecution for the grave rights abuses their forces are committing." Under ISIL's watch, women increasingly wore face veils and young men caught drinking alcohol were flogged. Education changes included male/female segregation of students, and the removal of history and geography from the curriculum. New Islamic religious police flyers ordered clothing stores to cover their mannequins and not to display "scandalous women's clothes that cause sedition." The law school was closed. In November 2014, ISIL's Cyrenaica wing claimed it had previously dispatched nine suicide bombers from Egypt, Libya, and Tunisia to carry out attacks against Libyan security forces in and around Benghazi. CNN reported that several of these attacks seemed to correspond to previously unclaimed suicide bombings, including a twin-attack on a Libyan special forces camp in Benghazi on 23 July 2014 and a 2 October 2014 attack on a military checkpoint near Benina airport. In January 2015, the group's Cyrenaica branch published photos claiming to show the execution of two Tunisian journalists who had been kidnapped in September 2014. On 27 January 2015, an attack on the Corinthia Hotel in Tripoli involving gunmen and a carbomb killed at least ten people, including five foreigners. The group's Tripoli branch claimed responsibility for the attack, claiming it was revenge for the death of Libyan al-Qaeda operative Abu Anas al-Libi in American custody earlier in the month. On 15 February 2015, ISIL released a video showing the beheading of 21 Christian Egyptians who had been kidnapped in Sirte. ISIL's Dabiq magazine had earlier published photos of the Copts and threatened to kill them to "avenge the kidnapping of Muslim women by the Egyptian Coptic Church". A 5 April 2015, ISIL's Tripolitania branch claimed responsibility for a suicide bombing on a checkpoint outside Misrata, which killed four and wounded 21. The Long War Journal wrote that no well-established Libyan militant organizations had pledged their support to the group and that "the Islamic State has failed, thus far, to garner the allegiance of Ansar al Sharia Libya, which is notorious for its role in the Sept. 11, 2012, terrorist attacks in Benghazi and remains one of the most powerful jihadist organizations in eastern Libya. None of Ansar al Sharia's allies in the Benghazi Revolutionaries Shura Council, the Islamist coalition fighting General Khalifa Haftar's forces for control of territory, pledged allegiance to Baghdadi. The Islamic State has supporters in Libya, particularly among the jihadist youth. But other groups are still, by all outward appearances, more entrenched." ↑ Masi, Alessandria (13 November 2014). "ISIS Leader Abu Bakr Al-Baghdadi Allegedly Alive, Announces Expansion of Islamic State Caliphate". International Business Times. Retrieved 1 January 2015. ↑ Zelin, Aaron Y. (14 November 2014). "ISIS Has Declared The Creation of Provinces in Several Arab Countries". Washington Institute for Near East Policy. businessinsider.com. Retrieved 31 December 2014. ↑ Zelin, Aaron Y. (14 November 2014). "The Islamic State's Archipelago of Provinces". Washington Institute for Near East Policy. Retrieved 31 December 2014. 1 2 Martin Pengelly (14 November 2015). "Islamic State leader in Libya 'killed in US airstrike'". The Guardian. Retrieved 14 November 2015. 1 2 "New Islamic State leader in Libya says group 'stronger every day'". Reuters. 10 March 2016. Retrieved 10 March 2016. ↑ "Obama Is Pressed to Open Military Front Against ISIS in Libya". The New York Times. 4 February 2016. Retrieved 5 February 2016. ↑ "ISIL's presence in Libya grows to 5,000 fighters". Al Jazeera. ↑ "Isis in Libya: How Muhammar Gaddafi's anti-aircraft missiles are falling into the jihadists' hands". ↑ "Libyan army gears up for Derna assault". Middle East Eye. Retrieved 29 January 2015. ↑ AFP (15 March 2015). "Libye - Libye : combats entre jihadistes de l'État islamique et miliciens Ã Syrte - Jeuneafrique.com - le premier site d'information et d'actualité sur l'Afrique". JEUNEAFRIQUE.COM. Retrieved 22 March 2015. ↑ "Islamic State fighters and force allied with Tripoli clash in central Libya". Reuters. 14 March 2015. Retrieved 14 March 2015. 1 2 "Al-Qaida-linked militants attack IS affiliate in Libya". Associated Press. 10 June 2015. Retrieved 10 June 2015. 1 2 Zelin, Aaron Y. (10 October 2014). "The Islamic State's First Colony in Libya". The Washington Institute. Retrieved 21 November 2014. ↑ "ISIS atrocity in Libya demonstrates its growing reach in North Africa". CNN. 25 March 2015. Retrieved 23 February 2015. ↑ "BBC News - Libya violence: Activists beheaded in Derna". BBC News. Retrieved 25 March 2015. 1 2 3 "Rising Out of Chaos: The Islamic State in Libya". Carnegie Endowment for International Peace. 5 March 2015. Retrieved 19 March 2015. 1 2 3 4 5 "How a Libyan city joined the Islamic State group". The Big Story. Retrieved 25 March 2015. ↑ Keilberth, Mirco; von Mittelstaedt, Juliane; Reuter, Christoph (18 November 2014). "The 'Caliphate's' Colonies: Islamic State's Gradual Expansion into North Africa". Spiegel Online. Retrieved 19 November 2014. 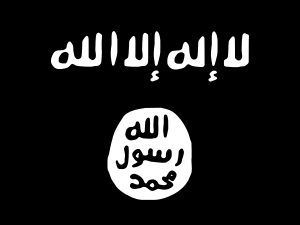 ↑ "Isis: Libya Baghdadi proclaimed chief of Derna Caliphate". ANSAmed. 31 October 2014. Retrieved 18 November 2014. ↑ "Islamic State leader urges attacks in Saudi Arabia: speech". Reuters. 13 November 2014. Retrieved 21 November 2014. ↑ "The Islamic State's Archipelago of Provinces". Washington Institute for Near East Policy. 14 November 2014. Retrieved 17 November 2014. Baghdadi also noted that his declaration entails "nullification" of all jihadist local groups in the five places mentioned above, as well as "the announcement of new wilayat (provinces) of the Islamic State and the appointment of wulat (governors) for them." ↑ "When The Caliphate Crumbles: The Future of the Islamic State's Affiliates". War on the Rocks. 13 June 2016. Retrieved 22 June 2016. ↑ Ernst, Douglas (18 November 2014). "Islamic State takes Libyan city; 100K under terror group's control as chaos spreads". The Washington Times. Retrieved 23 February 2015. ↑ Elmenshawy, Mohamed (25 August 2014). "Egypt's Emerging Libya Policy". The Huffington Post. Retrieved 25 September 2014. ↑ "ISIS woos Ansar al-Sharia in Libya". Magharebia. Retrieved 25 September 2014. ↑ "Ansar al Sharia Libya relaunches social media sites". Long War Journal. 9 April 2015. Retrieved 10 April 2015. ↑ "Jihadists Report Shariah Jurist in Ansar al-Shariah in Libya Pledging to IS". SITE. 28 March 2015. ↑ Peachey, Paul (14 October 2011). "Through hell and high water: final push in battle for Sirte". The Independent. Retrieved 20 October 2011. 1 2 "ISIS Finds New Frontier in Chaotic Libya". The New York Times. 10 March 2015. Retrieved 13 March 2015. 1 2 "Islamic State: Inside the latest city to fall under its sway". The Daily Telegraph. 10 March 2015. Retrieved 13 March 2015. 1 2 3 "Control and crucifixions: Life in Libya under IS". BBC News. 3 February 2016. Retrieved 4 February 2016. ↑ "The Islamic State's Uneven Trajectory in Libya". Jamestown Foundation. 17 September 2015. Retrieved 1 October 2015. ↑ "The Islamic State's Burgeoning Capital in Sirte, Libya". Washington Institute for Near East Policy. 6 August 2015. Retrieved 1 October 2015. ↑ "IS said to have taken another Libyan town". Times of Malta. 10 February 2015. Retrieved 13 February 2015. ↑ Hassan Morajea (6 June 2015). "Libyan gains may offer ISIS a base for new attacks". Washington Post. Retrieved 10 June 2015. ↑ "Islamic State militants in Libya 'seize Sirte airport'". bbc.com. BBC News. Retrieved 2015-05-29. ↑ Western Officials "Alarmed as ISIS Expands Territory in Libya" Check |url= value (help). The New York Times. 1 June 2015. Retrieved 18 June 2015. ↑ "Is a secret sniper killing off Isil's high command in Libya?". Telegraph.co.uk. 29 January 2016. ↑ William Watkinson. "War on Isis: Mystery sniper believed to have assassinated 3 Daesh chiefs in 10 days". International Business Times UK. ↑ Jon Dean (30 January 2016). "Mystery sniper dubbed 'Daesh Hunter' takes out three ISIS terror chiefs in Libyan city". mirror. ↑ "Isil 'wants its own navy for attacks on cruise ships in the Mediterranean'". Telegraph.co.uk. 28 January 2016. ↑ "Islamic State 'forced out' of key Libyan city of Derna". London,Uk. ↑ "Libyan Islamists claim to drive Islamic State from port stronghold". Reuters. 14 June 2015. Retrieved 18 June 2015. ↑ "Libya officials: Jihadis driving IS from eastern stronghold". AP. 30 July 2015. Retrieved 1 August 2015. ↑ Chris Stephen; Kim Willsher (24 February 2016). "French special forces assisting anti-Isis efforts in Libya, say sources". The Guardian. Retrieved 7 March 2016. ↑ Alastair Jamieson. "U.S. Fighter Jets Target ISIS in Libya's Sabratha; Dozens Killed". NBC News. ↑ Greg Botelho and Barbara Starr, CNN (19 February 2016). "U.S. strikes ISIS camp in Libya; 49 killed". CNN. ↑ Greg Botelho and Barbara Starr, CNN (20 February 2016). "U.S. strikes ISIS camp in Libya; 49 killed". CNN. ↑ "Isil recruiting migrant 'army of the poor' with $1,000 sign-up bonuses". Telegraph.co.uk. 1 February 2016. ↑ "The Emergence of the Islamic State's 'Cyrenaica Province' (Wilayat al-Barqa) in Libya". GLORIA Center. 17 November 2014. ↑ "11,000 migrants land in Italy in a week, ISIS had warned of sending over 500,000". The Independent. 17 April 2015. Retrieved 22 April 2015. ↑ Fadel, Leila (18 November 2014). "With Cash And Cachet, The Islamic State Expands Its Empire". Parallels. NPR. Retrieved 21 November 2014. ↑ "Libya: Extremists Terrorizing Derna Residents". Human Rights Watch. Retrieved 3 December 2014. ↑ "Libya bombings: Tobruk and al-Bayda attacked". BBC. 12 November 2014. Retrieved 14 November 2014. ↑ "Bombs explode near Egyptian and UAE embassies in Libyan capital". Reuters. 13 November 2014. Retrieved 14 November 2014. ↑ "ISIS: Libya, two human rights activists beheaded in Derna - General news - ANSAMed.it". Retrieved 29 January 2015. ↑ "ISIS Claims To Have Executed Two Tunisian Journalists". International Business Times. 8 January 2015. Retrieved 25 March 2015. ↑ "′Islamic State′ attacks Libya hotel - News - DW.DE - 27.01.2015". DW.DE. Retrieved 3 March 2015. ↑ Karadsheh, Jomana; Alkhshali, Hamdi (28 January 2015). "Gunmen attack Corinthia Hotel in Libya; at least 10 die". CNN. Retrieved 28 January 2015. ↑ "ISIL video shows Christian Egyptians beheaded in Libya". Al Jazeera. 16 Feb 2015. Retrieved 27 March 2015. ↑ "Libya violence: Islamic State attack 'kills 40' in al-Qubbah". BBC. 20 February 2015. Retrieved 20 February 2015. ↑ "Islamic State claims suicide bombing in Libya's Benghazi". Reuters. 24 March 2015. Retrieved 31 March 2015. ↑ "Four dead in Libya suicide bombing claimed by IS". AFP. 5 April 2015. Retrieved 8 April 2015. ↑ "Islamic State militants claim attacks on embassies in Libya". Reuters. 12 April 2015. Retrieved 14 April 2015. ↑ "Islamic State shot and beheaded 30 Ethiopian Christians in Libya: video". Reuters. 19 April 2015. Retrieved 21 April 2015. ↑ "Islamic State kills five journalists working for Libyan TV station-army official". Reuters. 27 April 2015. Retrieved 30 April 2015. ↑ "ISIS captures 88 Eritrean Christians in Libya, US official confirms". Fox News. Retrieved 10 June 2015. ↑ "An Islamic State affiliate claims credit for Libya attack". Daily Mail, Associated Press. 8 January 2016. Retrieved 8 January 2016. ↑ "Libyan city is first outside Syria, Iraq to join ISIS". Haaretz.com. 10 November 2014. Retrieved 18 November 2014. ↑ Joscelyn, Thomas. "Analysis: Islamic State snuff videos help to attract more followers". Long War Journal. Retrieved 21 November 2014. ↑ Ali Salem (21 November 2014). "Libya Dawn denies the presence of Daesh in Tripoli". Libya Herald. ↑ "Malta should press EU to intervene in Libya - Simon Busuttil". Times of Malta. 15 February 2015. Retrieved 19 April 2015. ↑ Micallef, Keith (15 February 2015). "Prime Minister calls for UN intervention in Libya". Times of Malta. Retrieved 19 April 2015. ↑ "Terrorist Designations of ISIL-Yemen, ISIL-Saudi Arabia, and ISIL-Libya". State.gov. 2016-05-19. Retrieved 2016-05-19.